Each semester, I do teaching for undergraduate engineering students as well as undergraduate and graduate math students. For details see "List of current courses and lectures". 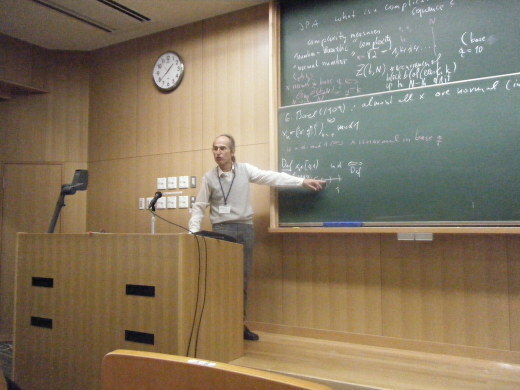 Furthermore, each year, I give a lecture in insurance mathematics. Ernst Stadlober and Robert Tichy, Ulrich Dieter 1932-2018, Internationale Mathematische Nachrichten, Österreichische Mathematische Gesellschaft, ÖMG, 238, (2018), 33–43. Peter Grabner, Robert Tichy and Gregory Derfel, On the asymptotic behaviour of the zeros of solutions of one functional-differential equation with rescaling, Chapter in , Springer, 263, (2018), 281–293. Manfred Madritsch and Robert Tichy, MULTIDIMENSIONAL VAN DER CORPUT SETS AND SMALL FRACTIONAL PARTS OF POLYNOMIALS, Mathematika, University College London, (2018). Michael Kerber and Robert Tichy, Constrained Triangulations, Volumes of Polytopes, and Unit Equations, In 33rd International Symposium on Computational Geometry (SoCG 2017), Schloss Dagstuhl - Leibniz-Zentrum für Informatik GmbH, (2017), 46:1—-46:15. T. Siegl and R. F. Tichy, Ruin theory with risk proportional to free reserve and securitization, Insurance / Mathematics & economics, Elsevier B.V., 26, (2016), 59–73. Thonhauser, Stefan Michael, Robert Tichy, Iaco, Maria Rita, Oto Strauch and Vladimir Balaz, An extremal problem in uniform distribution theory, Uniform Distribution Theory, Slovak Academy of Sciences, (2016). Iacò, Maria Rita and Wolfgang Steiner, Linear recursive odometers and beta-expansions, Uniform Distribution Theory, Slovak Academy of Sciences, 11(1), (2016), 175–186. Dijana Kreso, Functional composition of polynomials: indecomposability, Diophantine equations and lacunary polynomials, Grazer mathematische Berichte, 363, (2015), 143–170. Manfred Madritsch and Robert Tichy, Dynamical systems and uniform distribution of sequences, Chapter in , Springer Verlag, (2015). Bergelson V., [No Value], Grigori Kolesnik and Manfred Madritsch, Younghwan Son and Robert Tichy, Uniform distribution of prime powers and sets of recurrence and van der Corput sets in Z^k, Israel journal of mathematics, Springer New York, 201(2), (2014), 729–760. Robert Tichy and István Berkes, Lacunary series and stable distributions, Chapter in , ., (2013), 135–143. Manfred Madritsch and Robert Tichy, Construction of normal numbers via generalized prime power sequences, Journal of Integer Sequences, AT & T, 16(2), (2013), 17 –30. 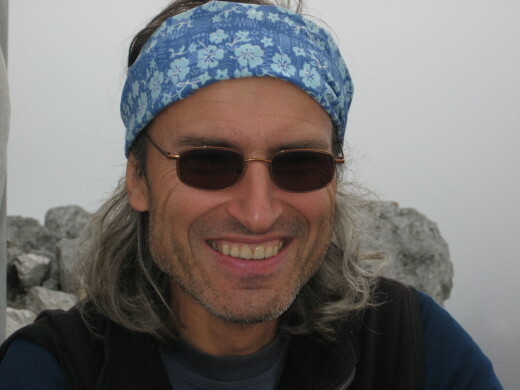 Christoph Aistleitner, Markus Hofer and Robert Tichy, A central limit theorem for Latin hypercube sampling with dependence and application to exotic basket option pricing, International journal of theoretical and applied finance, World Scientific Publishing Co Pte Ltd, 15, (2012), 1–20. Christoph Aistleitner, István Berkes and Robert Tichy, On the system $f(nx)$ and probabilistic number theory, In Analytic and Probabilistic Number Theory, ., (2012), 1–18. Christoph Aistleitner, István Berkes and Robert Tichy, On permutations of lacunary series, RIMS Kôkyûroku / Bessatsu, B34, (2012), 1–25. Christoph Aistleitner, István Berkes and Robert Tichy, On the law of the iterated logarithm for permuted lacunary sequences, Proceedings of the Steklov Institute of Mathematics, Springer Science+Business Media, 276, (2012), 3–20. Christoph Aistleitner, István Berkes and Robert Tichy, On permutations of Hardy- Littlewood-Pólya sequences, Transactions of the American Mathematical Society, American Mathematical Society, 363, (2011), 6219–6244. Christoph Aistleitner, István Berkes and Robert Tichy, On the asymptotic behavior of weakly lacunary sequences, Proceedings of the American Mathematical Society, American Mathematical Society, 139(7), (2011), 2505–2517. Robert Tichy, Christoph Aistleitner and István Berkes, Lacunary sequences and permutations, Chapter in , Kendrick Press, (2010), 35–49. Robert Tichy and Martin Zeiner, Baire results of multi-sequences, Uniform Distribution Theory, Slovak Academy of Sciences, 5(1), (2010), 13–44. István Berkes, Bradley, Richard C., Herold Dehling, Magda Peligrad and Robert Tichy, Dependence in Probability, Analysis and Number Theory, Kendrick Press, (2010). Robert Tichy and Johannes Wallner, Johannes Frischauf - eine schillernde Persönlichkeit in Mathematik und Alpinismus, Internationale Mathematische Nachrichten, Österreichische Mathematische Gesellschaft, ÖMG, 210, (2009), 21–32. Robert Tichy, Nachruf auf Edmund Hlawka, Monatshefte für Mathematik, Springer Wien, 158, (2009), 107–120. Fuchs, Clemens Josef, Robert Tichy and Volker Ziegler, On quantitative aspects of the unit sum number problem, Archiv der Mathematik, Birkhauser Verlag Basel, 93, (2009), 259–268. Thomas Stoll and Robert Tichy, Diophantine equations for Morgan-Voyce and other modified orthogonal polynomials, Mathematica Slovaca, deGruyter, 58(1), (2008), 11–18. Robert Tichy and Stephan Wagner, Algorithmic generation of molecular graphs with large Merrifield-Simmons index, Match - communications in mathematical and in computer chemistry, University of Kragujevac, Faculty of Science, 59(1), (2008), 239–252. Volker Ziegler, Robert Tichy and Alan Filipin, The additive unit structure of purely quartic complex fields, Functiones et approximatio, Adam Mickiewicz University Press, 39(1), (2008), 113–131. Robert Tichy, Nachruf auf Walter Philipp, Monatshefte für Mathematik, Springer Wien, 153, (2008), 177–182. Robert Tichy, Volker Ziegler and Alan Filipin, On the quantitative unit sum number problem - an application of the subspace theorem, Acta Arithmetica, Instytut Matematyczny, 133, (2008), 297–308. Volker Ziegler and Robert Tichy, Units generating the ring of integers of complex cubic fields, Colloquium mathematicum, Institute of Mathematics, Polish Academy of Sciences, 109(1), (2007), 71–83. Volker Ziegler, Robert Tichy and Stephan Wagner, Graphs, Partitions and Fibonacci Numbers, Discrete applied mathematics, Elsevier B.V., 155(10), (2007), 1175–1187. Robert Tichy, István Berkes and Walter Philipp, Pseudorandom numbers and entropy conditions, Journal of complexity, Academic Press, 23(4-6), (2007), 516–527. Clemens Heuberger, Attila Pethö and Robert Tichy, Thomas' Family of Thue Equations over Imaginary Quadratic Fields, II, Sitzungsberichte und Anzeiger / Österreichische Akademie der Wissenschaften, Mathematisch-Naturwissenschaftliche Klasse : Abteilung I, Biologische Wissenschaften und Erdwissenschaften ; Abteilung II, Mathematische, Physikalische und Technische Wissenschaften, Verlag der Österreichischen Akademie der Wissenschaften, 142, (2006), 3–7. István Berkes, Walter Philipp and Robert Tichy, Empirical processes in probabilistic number theory: the LIL for the discrepancy of $(n_kw)$ mod 1, Illinois journal of mathematics, University of Illinois at Urbana-Champaign, 50(1), (2006), 107–145. Hansjörg Albrecher, Jürgen Hartinger and Robert Tichy, On the distribution of dividend payments and the discounted penalty function in a risk model with linear dividend barrier, Scandinavian Actuarial Journal, Taylor and Francis Ltd., no. No. 2, (2005), 103–126. Peter Grabner, Pierre Liardet and Robert Tichy, Spectral Disjointness of Dynamical Systems Related to Some Arithmetic Functions, Publicationes Mathematicae, Kossuth Lajos Tudomanyegyetem, 66, (2005), 213–244. Ladislav Misik and Robert Tichy, Large null sets in metric spaces, Journal of mathematical analysis and applications, Academic Press, 305, (2005), 424–437. Jörg Thuswaldner and Robert Tichy, Waring's problem with digital restrictions, Israel journal of mathematics, Springer New York, 149, (2005), 317–344. Andrej Dujella, Ivica Gusic and Robert Tichy, On the indecomposability of polynomials, Sitzungsberichte und Anzeiger / Österreichische Akademie der Wissenschaften, Mathematisch-Naturwissenschaftliche Klasse : Abteilung I, Biologische Wissenschaften und Erdwissenschaften ; Abteilung II, Mathematische, Physikalische und Technische Wissenschaften, Verlag der Österreichischen Akademie der Wissenschaften, 214, (2005), 81–88. Robert Tichy and Stephan Wagner, Extremal Problems for Topological Indices in Combinatorial Chemistry, Journal of computational biology, Mary Ann Liebert Inc., 12(7), (2005), 1004–1013. T. Stoll and R. F. Tichy, Diophantine equations involving general Meixner and Krawtchouk polynomials, Quaestiones mathematicae, Taylor and Francis Ltd., 27, (2004), 105–115. T. Stoll and R. F. Tichy, The Diophantine equation alpha(x choose m)+beta(y choose n)=gamma, Publicationes Mathematicae, Kossuth Lajos Tudomanyegyetem, 64, (2004), 155–165. Jürgen Hartinger, Reinhold Kainhofer and Robert Tichy, Quasi-Monte Carlo Algorithms for unbounded, weighted integration problems, Journal of complexity, Academic Press, 20(5), (2004), 654–668. Hansjörg Albrecher, Jürgen Hartinger and Robert Tichy, Quasi-Monte Carlo techniques for CAT bond pricing, Monte Carlo methods and applications, de Gruyter, 10(3-4), (2004), 197–212. G. Dorfer and R. F. Tichy, Quadratic algebraic numbers with finite $b$-adic expansion on the unit circle and their distribution, Mathematische Nachrichten, Wiley-VCH, 273, (2004), 58–74. Fuchs, Clemens Josef and Robert Tichy, Perfect powers in linear recurring sequences, Acta Arithmetica, Instytut Matematyczny, 107.1, (2003), 9–25. Hansjörg Albrecher, Reinhold Kainhofer and Robert Tichy, Simulation Methods in Ruin Models with Non-linear Dividend Barriers, Mathematics and Computers in Simulation, Elsevier B.V., 62, (2003), 277–287. Fuchs, Clemens Josef, Robert Tichy and Attila Pethö, On the Diophantine equation G_n(x)=G_m(P(x)): higher-order recurrences, Transactions of the American Mathematical Society, American Mathematical Society, 355, (2003), 4657–4681. Gerhard Larcher, Martin Predota and Robert Tichy, Arithmetic average options in the hyperbolic model, Monte Carlo methods and applications, de Gruyter, 9, (2003), 227–239. Hansjörg Albrecher, Jürgen Hartinger and Robert Tichy, Multivariate approximation methods for the pricing of catastrophe-linked bonds, International series of numerical mathematics, 145, (2003), 21–39. L. L. Cristea and R. F. Tichy, Discrepancies of point sequences on the Sierpinski carpet, Mathematica Slovaca, deGruyter, 53, (2003), 351–367. M. Pasteka and R. F. Tichy, A note on the correlation coeffcient of arithmetic functions, Acta Academiae Paedagogicae Agriensis / Sectio Mathematicae, Eszterhazy Karoly College, 30, (2003), 109–114. T. Stoll and R. F. Tichy, Diophantine equations for classical continuous orthogonal polynomials, Indagationes mathematicae, Elsevier B.V., 14, (2003), 263–274. Fuchs, Clemens Josef, Robert Tichy and Andrej Dujella, Diophantine m-tuples for linear polynomials, Periodica mathematica Hungarica, Springer Netherlands, 45(1-2), (2002), 21–33. W. Philipp and R. F. Tichy, Metric theorems for distribution measures of pseudorandom sequences, Monatshefte für Mathematik, Springer Wien, 135, (2002), 321–326. Y. Bilu, B. Brindza, P. Kirschenhofer, A. Pinter and R. F. Tichy, Diophantine equations and Bernoulli polynomials, Compositio mathematica, Cambridge University Press, 131, (2002), 173–188. T. Siegl and R. F. Tichy, A model in ruin theory using derivative securities, Schweizerische Aktuarvereinigung: Mitteilungen, no. 1, (2002), 13–30. Fuchs, Clemens Josef, Robert Tichy and Attila Pethö, On the Diophantine equation G_n(x)=G_m(P(x)), Monatshefte für Mathematik, Springer Wien, 137(3), (2002), 173–196. Hansjörg Albrecher, Reinhold Kainhofer and Robert Tichy, Efficient Simulation Techniques for a Generalized Ruin Model, Grazer mathematische Berichte, 245, (2002), 79–110. Peter Grabner, Peter Kirschenhofer and Robert Tichy, Combinatorial and arithmetical properties of linear numeration systems, Combinatorica, Janos Bolyai Mathematical Society, 22, (2002), 245–267. Reinhold Kainhofer and Robert Tichy, QMC methods for the solution of differential equations with multiple delayed arguments, Grazer mathematische Berichte, 345, (2002), 111–129. A. Dujella and R. F. Tichy, Diophantine equations for second order recursive sequences of polynomials, The quarterly journal of mathematics, Oxford University Press, 52, (2001), 161–169. Hansjörg Albrecher, Jozef Teugels and Robert Tichy, On a gamma series expansion for the time-dependent probability of collective ruin, Insurance / Mathematics & economics, Elsevier B.V., 29(3), (2001), 345–355. István Berkes, Walter Philipp and Robert Tichy, Pair correlation and U-statistics for independent and weakly dependent random variables, Illinois journal of mathematics, University of Illinois at Urbana-Champaign, 45, (2001), 559–580. Hansjörg Albrecher and Robert Tichy, Zur Konvergenz eines Lösungsverfahrens für ein Risikomodell mit gammaverteilten Schäden, Schweizerische Aktuarvereinigung: Mitteilungen, no. 2, (2000), 115–127. Hansjörg Albrecher, Jiri Matousek and Robert Tichy, Discrepancy of point sequences on fractal sets, Publicationes Mathematicae, Kossuth Lajos Tudomanyegyetem, 56(3-4), (2000), 233–249. M. Pasteka and R. F. Tichy, Uniformly distributed sequences and rings of complex numbers, Rivista di matematica della Università di Parma, Università degli Studi di Parma, 3, (2000), 1–10. Y. F. Bilu, T. Stoll and R. F. Tichy, Octahedrons with equally many lattice points, Periodica mathematica Hungarica, Springer Netherlands, 40, (2000), 229–238. Bilu, Yuri F. and Robert Tichy, The diophantine equation f(x)=g(y), Acta Arithmetica, Instytut Matematyczny, 95(3), (2000), 261–288. Wolfgang Müller, Jörg Thuswaldner and Robert Tichy, Fractal properties of number systems, Periodica mathematica Hungarica, Springer Netherlands, 42, (2000), 51–68. J. M. Thuswaldner and R. F. Tichy, An Erdös-Kac theorem for systems of $q$-additive functions, Indagationes mathematicae, Elsevier B.V., 11, (2000), 283–291. 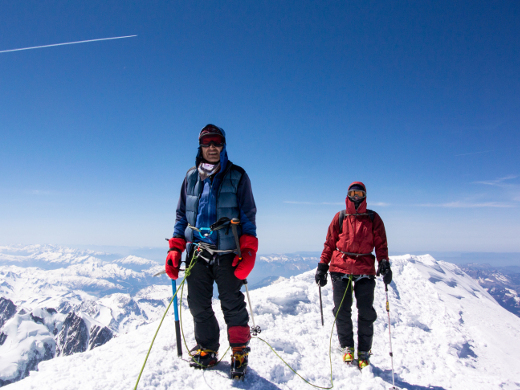 You might also like to have a look at some photographs taken at regular mountain tours.